Plaka 10 km from Chania: Very beautiful, comfortable villa Odysseus, 3 storeys, built in 2004, renovated in 2014. Outside the resort, 300 m from the centre of Plaka, in a quiet, sunny position, area with little traffic, 2 km from the sea, 2 km from the beach. Private: property 135 m2 (fenced) with beautiful garden to relax, courtyard, swimming pool fenced (28 m2, 01.05.-31.10.). Garden furniture, barbecue. In the complex: with TV, internet access, WiFi, air conditioning. Linen change 2 times per week. Towel change 2 times per week. Parking, single garage. Shop, grocery 300 m, supermarket 2 km, shopping centre 2 km, restaurant, bar, bakery, cafe 300 m, sandy beach Almirida 2 km. Nearby attractions: Ombrosgialos 5 km, Gavaloxori 3 km, Vamos 4 km. Please note: car recommended. Suitable for families. There are more similar properties for rent in this same residence. Property ref. GR6456.302.1 is situated on the same property. Odysseus, 4-room villa 135 m2 on 3 levels. 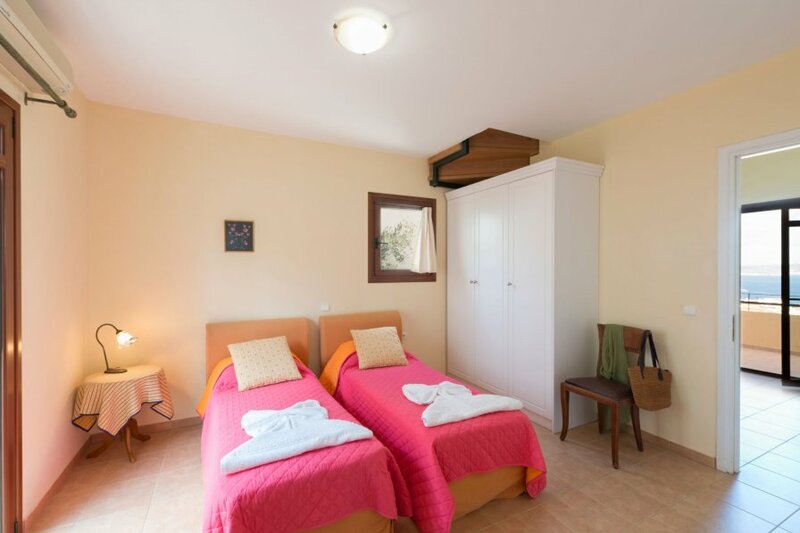 Spacious and bright, renovated in 2014, very comfortable and wooden furniture furnishings: living/dining room with 2 sofabeds, open-hearth fireplace, dining table, kitchen corner, separate WC, satellite TV and air conditioning. Exit to the patio, to the swimming pool. Kitchen (4 ceramic glass hob hotplates, microwave, freezer). Bathroom, shower/WC. Upper floor: 1 double bedroom with 1 double bed and air conditioning. Exit to the balcony. 1 double bedroom with 2 beds and air conditioning. Bathroom, shower/bidet/WC. 2nd upper floor: open gallery with 2 beds and air conditioning. Comfortable furnishings in the country house style. Balcony furniture, barbecue. Marvellous, of the sea, the mountains, the swimming pool and the garden. Facilities: Internet (WiFi, free). Garage. Suitable for families.